Will CLOAK, DAGGER, BOMBSHELL, SPIDER-WOMAN and SPIDEY be enough to take down the evil ROXXON CORPORATION? And what is Miles’ new girlfriend’s secret? Story- In this issue we learn about Bombshell’s past and she battles both Miles Morales/Spider Man and Spider Woman. Elsewhere Cloak & Dagger reaffirm their love and make plans to take down Roxxon. The Roxxon Brain trust calls for mercenary Taskmaster to bring Bombshell back. While the teens talk on a roof Taskmaster attacks and subdues all three. Cover- A close up of Miles arm shooting a web tether. The background is a detailed rendition of New York. I dig it! Art- Dave Marquez flexes his artistic muscle for this issue by giving us a dash of diversity. In the Sombre places the art takes on a darker moodier tone while outside in the the present is bright, vivid and smooth. Kudos to Justin Ponsor’s colors as well which compliment the whole package from start to finish. Characterization– It was interesting to see the origin of Bombshell and her connection to the evil Roxxon Corporation. I also dig the portrayal of the Roxxon Brain trust. They have this curiosity inherent even in real world scientists but with the typical comic book twist of taking it too far. 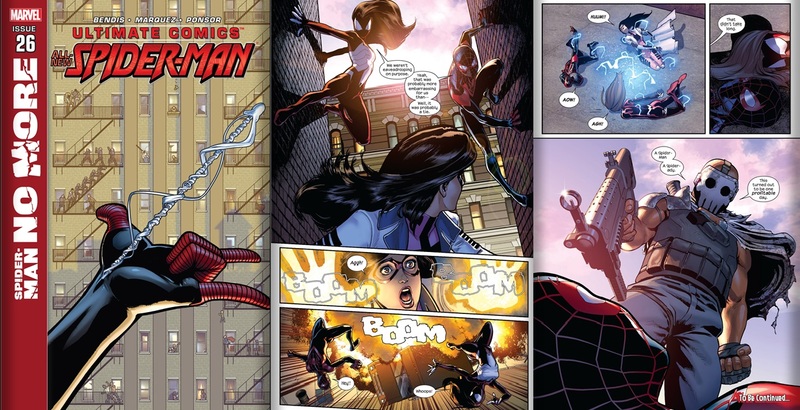 Miles and Spider woman continue to have great chemistry and play well off each other. Black Heroes– Miles Morales and Cloak are here and introducing the Ultimate Taskmaster!